For a long time, I had a very reliable, mid level, domestic espresso machine. I remember buying it in central London, after a long tour and I remember struggling to get it out of the boot, telling myself the weight of it justified the price of it. It went in the kitchen, in the corner, on its own sideboard and, quickly becoming a large part of my life, it stayed there for years. I would turn it on in the morning, before I was even awake, I would hold it for warmth in the winter, and I would use it every day, more than once, all the time, to make coffee, not just for myself, but visiting family members, local friends and a variety of tradespeople. There were no external signs of damage and I owned a screwdriver. So, eager to understand how it once worked, eager to quickly pinpoint and rectify the current problem and eager to rebuild the whole thing better than before – I dismantled it. Soon enough the espresso machine was gone, replaced by a functionless heap of its own constituent parts the nature of which I could neither identify or comprehend. Faced with this godless sprawl of unknown components, tangled tubes and what felt like a billion tiny screws, I let my eyes drift out of focus and waited quietly for understanding to emerge and expertise to announce itself. After forty minutes, I put everything in a pile, on the floor, in the corner. Then I wiped the table and filled the kettle. That pile is still on the floor, years later, and I remain not simply incapable of rebuilding the machine or identifying it’s problems, but barely able to even remember how this paltry hodge podge of de-purposed parts, redundant in isolation and gathering dust, could have once been the interlocking pieces of something that actually seemed to work. Only it’s not an espresso machine, it’s my understanding of the world. 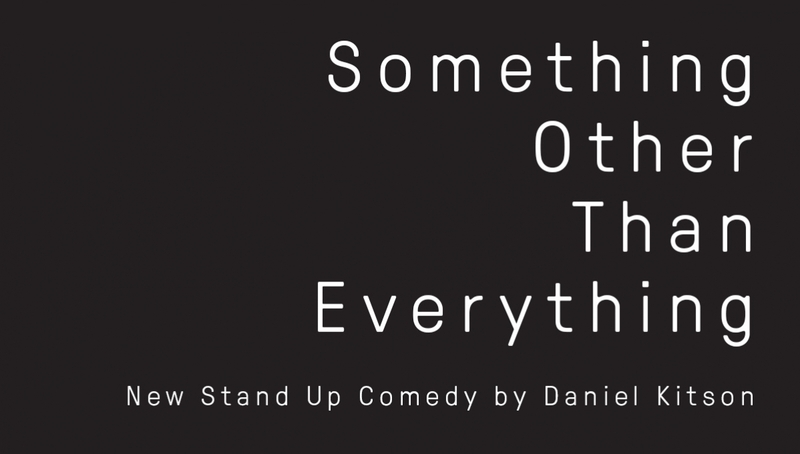 Daniel Kitson takes up residency at the Roundhouse for three weeks this summer with his first solo work in London for just under four years. Marooned in the middle of a circle of microphones, speakers, lights and people he will attempt to not simply dismantle and rebuild his own ideas about compassion, isolation, solidarity and progress but in doing so momentarily alter the function of language and invent a new form of stand up comedy. Please bring ID to the venue as anti-touting measures will be in operation. If you select to receive your tickets in the post, they will be sent out two weeks before the show. One of London’s most sought after caterers, the-recipe, will be taking up residency in our kitchen in MADE with a pre-show dining menu for the whole show run of Something Other Than Everything.